I know this is beating on a dead horse but some dead horses deserve a beating. Just a few days ago, the very politically dead man who naively agreed on a deal with Uhuru pre-election only to have Uhuru shred the MOU to pieces the next day proved to the world how inept and politically naive he is by once again rushing to try and make yet another deal Uhuru will obviously never honor either because the obviously compromised IEBC’s announcement that he won is thrown out and he doesn’t make it in the ensuing elections or he does and in keeping with tradition from his political mentors, he promptly tosses the MOU with Mudavadi yet again. 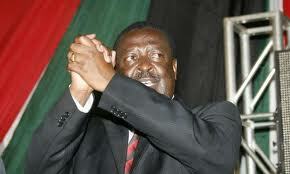 What the politically dead Mudavadi is doing is leaving even his close friends and aids shaking their heads. I write in response to the article by Mr Juma Kwayera titled, Mudavadi shift to Jubilee draws supporters’ ire, which appeared in The Standard On Sunday of March 17. In the article, the writer refers to me as Head of Mudavadi’s campaign Secretariat and also quotes me as supporting his move to Jubilee. I would like to put the record straight with regard to these false claims. First, I left the Secretariat on January 16, by mutual agreement with Deputy Prime Minister Musalia Mudavadi after which he appointed someone else to head it. This needs to be corrected to remove any impression of impersonation to a position that is no longer relevant to me. Second, it is true Kwayera called me on Friday to ask about Mudavadi’s reported move to Jubilee. My answer to him was that, “It was his constitutional right to seek association with any person, or group of persons to advance his political career taking into account the interests of his supporters”. My response emphasised the principle of freedom of association enshrined in the Constitution. Should he consider that Jubilee provides him with that avenue; it is within his rights to proceed. That does not amount to my supporting or endorsing his intentions and actions. I would like to clarify and emphasise that Mr Mudavadi has not sought my opinion on the matter nor have I volunteered it. It is, therefore, erroneous to pretend to offer one. Furthermore, it would be out of character and untimely to provide such advice given the ongoing litigation regarding the recent election. Lastly, Mudavadi’s supporters reserve their right to give their opinion of their leader in whom they had invested their hopes, aspirations and their future, to assume the leadership of this country.By not consulting them on such an important political move exposes him as lacking the tenacity decide on how to pursue the quest for that national leadership role. (Emphasis mine). This a damning judgment from someone who only a as late as this past January was was a major advisor of Mudavadi and no doubt jumped sheep before the elections convinced the man was headed nowhere or over the cliff which is exactly where he finds himself. The irony of it is it’s only Raila who can once again revive the dead political career of this man who seems not to learn anything from past experiences and is still naive enough to believe Uhuru can make a deal with him he can keep, never mind one William Ruto couldn’t care less about such deal and will see to it it’s smothered to death faster than Uhuru can smother it were the ICC inductees to be legally elected as president and deputy–an unlikely event in by itself but time will tell. Generally I don’t learn post on blogs, however I would like to say that this write-up very pressured me to try and do so! Your writing taste has been surprised me. Thanks, very nice post.